This typical Spanish tapa is simple, quick and easy. Green and yellow peppers fried with Spanish chorizo sausage and garlic make a colorful addition to the table. Serve on a platter in the center of the table and mound the mixture on slices of fresh rustic bread. It is also a great first course or accompaniment to scrambled eggs. Rinse green and yellow peppers, then remove stems and seeds. Peel and finely chop garlic and set aside. Cut chorizo into 1-inch lengths. Pour 4 to 5 tablespoons olive oil into a heavy-bottomed frying pan and heat. When the oil is hot, fry chorizo pieces and pepper strips, stirring often. When peppers are browned and almost cooked, add minced garlic and continue to fry. 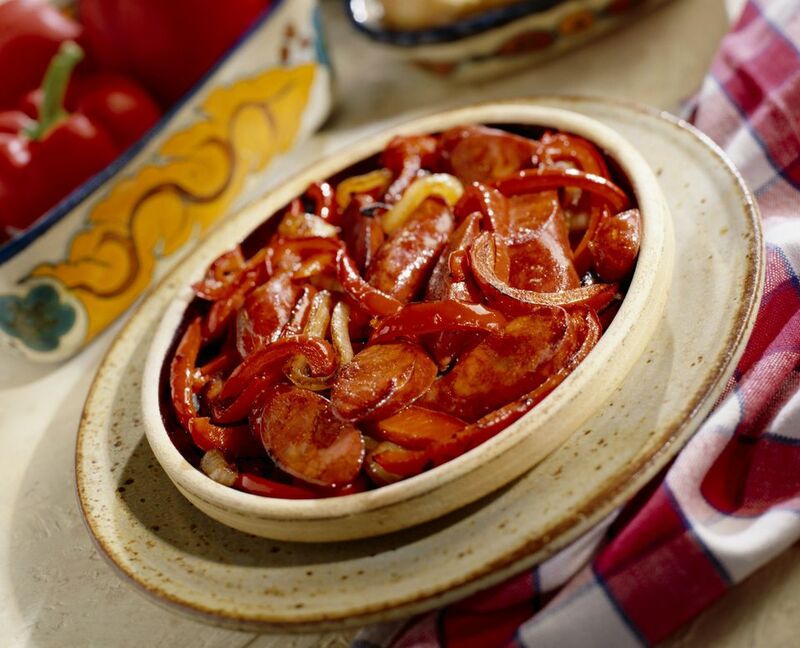 When chorizo and peppers are completely cooked, serve on a platter with rustic bread.